What with Christmas just around the corner, it’s time to get your home looking all exciting, wonderfully festive and with style. Check out our top tips and then it’s over to you to get your home looking all magical. To have a faux or a real Christmas tree? Decorate a beautiful, traditional tree, that takes centre stage with its wonderful warm sweet pine smell or are you going to go for a minimalist modern yet eye-catching one? If minimalist is the way forward for you, think natural branches spray painted white with minimal white decorations hung upon them and placed into a simple yet solid vase. Or, chalk up your own tree onto a wall as your own “art-piece” and light it up with real fairy lights hanging across it and decorate it with real baubles for a 3-d effect. Secondly, what’s your colour theme going to be this year? Are you going to go for one colourway and stick with it or are you going to go all out create a creative mix of vibrant bright colours? 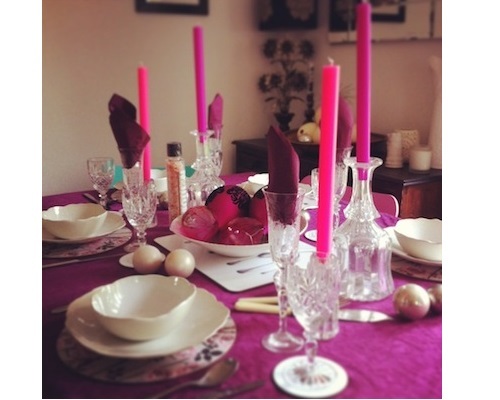 If you’re thinking of going for one colour then pink is the all important hue this Christmas. We’re not talking a simple pastel girlie pink but pink with punch and attitude. Mix up the pinks, put hot pink alongside rich magenta and turn it up further with a hint of neon pink and then tone it down with a hint of dusky pink. It’s all about the mixing of the pink tones that creates that richness and “wow” feeling. If it’s a modern mix of colours then go all out with an electric colour riot, teal blues, next to moss greens, midnight blues, regal purples, magentas, a touch of orange and even a dash of sulphur yellow. Thirdly, now that you have decided on your “Christmas colour scheme” and also if you are mixing tradition with modern or are going to go for all out modern, it’s time to think about where to decorate. After all the decorating isn’t just for the tree, spread it out, make a statement and go for it across your home, deck it all out, after all it’s only Christmas once a year. Decorate the tree, then think about your shelves, your side tables, fireplaces, coffee tables and windows. Add fairy lights around mirrors, cluster candles along your mantlepieces, add Church candles into your fire places or extra large oversized baubles in a transparent vase or large wooden bowl. Place beautiful garlands in your hallways, wrap them around and up your staircases. Just go for it but with style. Fourthly, there’s the Christmas table, which deserves the same treatment as the rest of the house, if not more, as if you’re hosting Christmas – it needs to look inviting and get those festive flavours rising. Table mats, placemats, folded napkins and tablecloths add warmth to the table and then start layering on the plates, the cutlery, the glasses, followed by the serving bowls, platters and serving spoons. To top it all off, add baubles or candles, even fairy lights down the centre of the table for that perfect Christmas vibe.